And relearn she did. She went through therapy with the same focus and drive she brought to military training. She was not only determined to get back to where she was before—she wanted to be even better. “I wouldn’t accept that I had any limitations, or that I couldn’t accomplish certain things,” she said. And one of those things was getting back to the military. 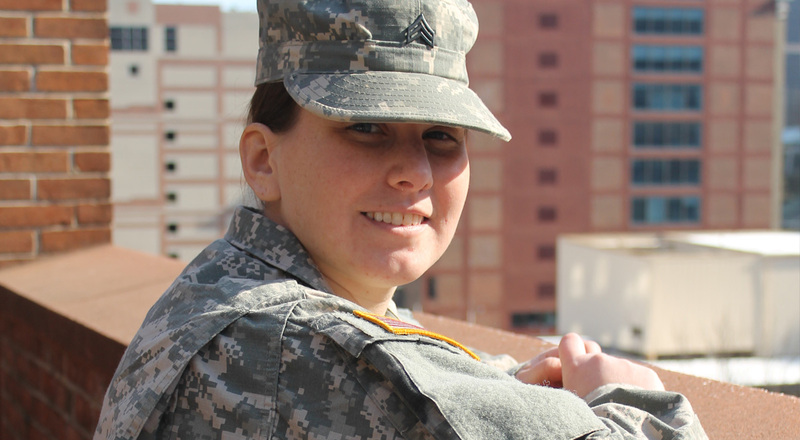 While her time as an inpatient and outpatient prepared her for life in the real world, she had a long way to go before she was National Guard ready. Not only did she have to meet physical requirements to be cleared for active duty, but she also had to relearn skills and procedures she had down before her injury. “I went to the gym every day to get my strength back,” she said. “But I also reread all my military manuals, and retaught myself everything I could. When I was allowed to go back for drills, I practiced with my team. I was determined." So what’s next for Jacqueline? She is currently working toward a career in rehabilitation with soldiers and other military personnel. She wants to provide others with the same support that was provided to her—and everyone at Magee agrees there’s no one better suited for that role than her.